Secura Personal Skin Care Kit with - 59430400 Secura Personal Cleanser 8 oz. 59431500 Secura Protective Ointment 2.47 oz. - Sold By Kit . This is a top quality wound care product by Smith and Nephew, Inc. ADW Diabetes has a wide range of these and other wound care supplies at great prices. 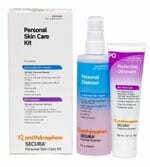 You are viewing Smith and Nephew Secura Personal Skin Care Kit with - 59430400 Secura Personal Cleanser 8 oz. 59431500 Secura Protective Ointment 2.47 oz. - Sold By Kit by Smith and Nephew, Inc. a leading manufacturer of wound care supplies. ADW Diabetes carries a wide range of Smith and Nephew, Inc. wound care products, including dressings, cleansers, gels, barriers lotions, and pads. and more, at every day low prices.